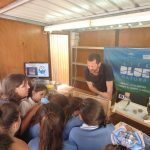 The Life Blue Natura is a European project, coordinated by la Regional Ministry of Environment and Planning. Junta De Andalucía, in cooperation with the Environment and Water Agency of Andalusia, CSIC-CEAB, IUCN-Med and Man and Territory Association (HyT). The project is scheduled over a four year period (from 2015 to 2019). This project has a budget of 2.513.792 €, funded by the Life European Project and CEPSA.